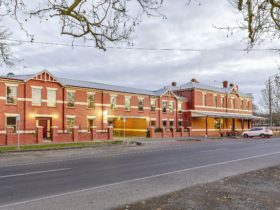 What better place to stay than right in the historic Eureka Stockade precinct when visiting Ballarat. 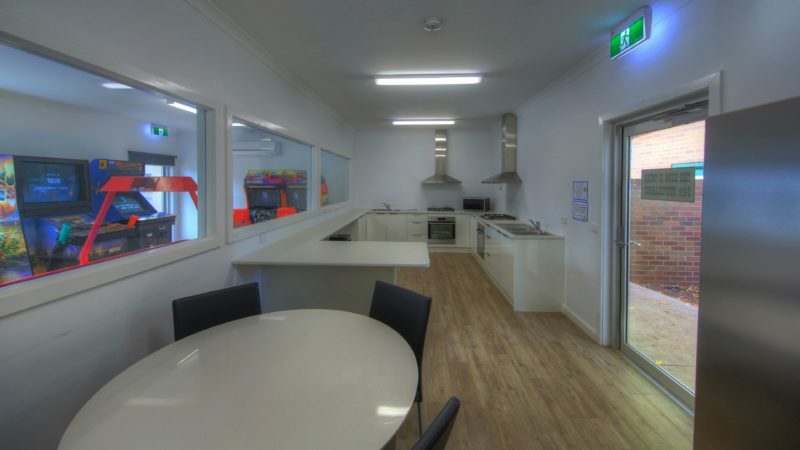 Eureka Stockade Holiday Park is located directly alongside to the Eureka Stockade monument and reserve which boasts an adventure playground for the children to enjoy. 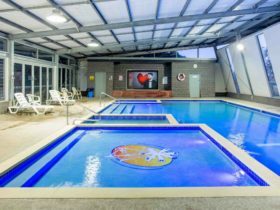 Also next door is the largest outdoor heated pool in Ballarat (open from November to April) and offers free entry to all guests of Eureka Stockade Holiday Park. 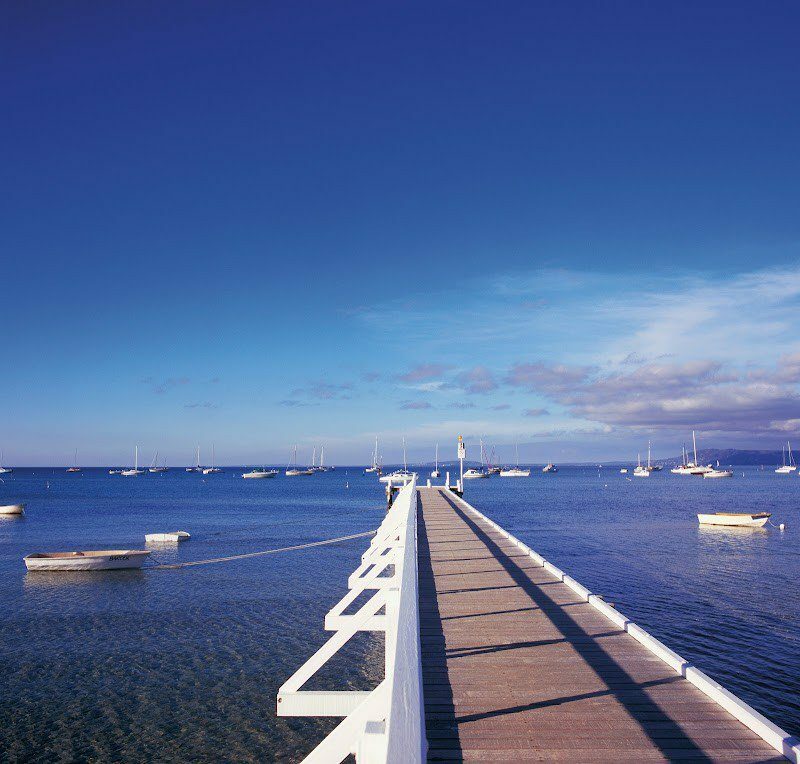 Eureka Stockade Holiday Park is conveniently located to all of Ballarat’s main attractions and only two kilometres to the Ballarat CBD. The ‘must see’ Museum of Democracy at Eureka (M.A.D.E) is just metres away and you can easily walk to the Ballarat Wildlife Park and Mount Xavier Golf Course. Ballarat’s famous Sovereign Hill and Kryal Castle are just a few minutes’ drive. 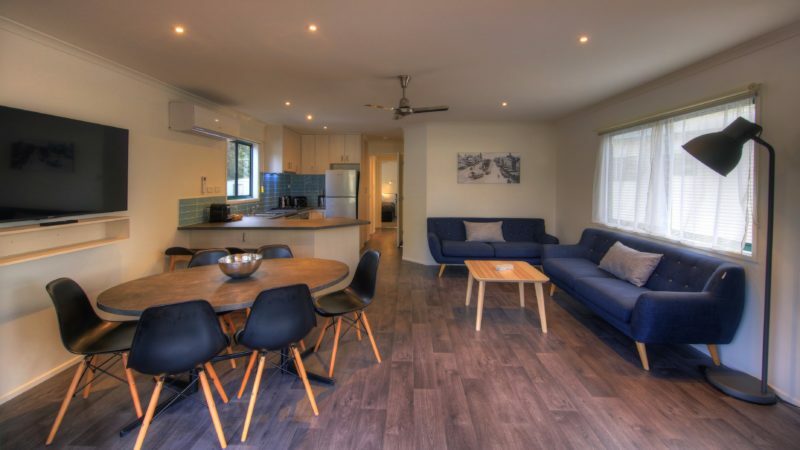 Eureka Stockade Holiday Park welcomes all guests and offers a variety of cabins to suit your holiday style from luxury three bedroom premium villas to budget cabins. They also accommodate motorhomes, fifth wheelers, large caravans and tents on spacious powered sites and ensuite sites. Your hosts Luke and Brooke and their team look forward to welcoming you. The two bedroom cottages are a great budget cabin with everything you need for a reasonable price. The cottage offers a small lounge area and a two seater sofa. There is no balcony in this cabin. With a double bed in the master room and two sets of single bunk beds in the second bedroom. Linen provided for the number of people included in the booking. 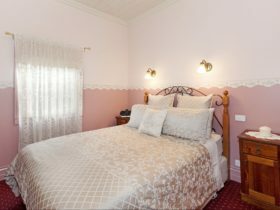 Cottage includes an electric blanket on main bed, microwave, oven fridge, kettle, toaster, crockery, cutlery, pots and pans, split system heating and air conditioner, digital flat screen television with DVD player, ensuite and hair dryer. The two bedroom cottages are one of the more standard cabins. They have all the essentials for a good night’s sleep though a very small living area. They would recommend these cabins for a short stay and for those travelling solo or two singles to share. The cottage has a small balcony with a two seated outdoor table and no couch in the living area. With one queen bed in the master room and one double bed with a single bunk above the double. 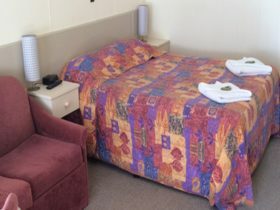 Linen provided for the number of people included in the booking. 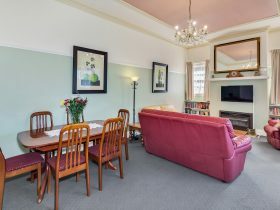 Cottage includes: electric blanket on main bed, microwave, oven, grill, fridge, crockery, cutlery, pots, pans, kettle, toaster, air con, heating, digital flat screen television with DVD Player, ensuite and hair dryer. The one bedroom cabin is our most basic cabin we have. Offering an open plan cabin with bedding at each end and a fully equipped kitchen in the middle. The external ensuite is private to your cabin and is only one small step outside the main cabin door. With one double bed and two sets of single bunk beds. Linen provided for the number of people included in the booking. Cabin includes: electric blanket on main bed, electric cook top, grill, microwave, oven, fridge, crockery, cutlery, pots, pans, kettle, toaster, flat screen television with DVD player, split cycle air con and heating. The one bedroom villas are nice and cosy for a couple, a solo traveller or a short stay for more than two utilising the pull out sofa bed. The villa offers a small lounge area with vaulted ceilings, a two seater sofa and a medium size balcony with outdoor seating. The living area and main bedroom is included with ceiling fans. With one double bed in the master room and a double pull-out sofa bed in living area. Linen provided for the number of people included in the booking. Villa includes: electric blanket on main bed, microwave, stove, oven, fridge, electric frypan, kettle, toaster, crockery, cutlery, pots and pans, split system heating and air conditioner, digital television with DVD player, small flat screen television in master room, ensuite, hair dryer, iron and Iron Board. The two bedroom villas are the perfect simple cabin for families and a popular cabin for those who are travelling for business. Offering a lounge area with vaulted ceilings, two seater couch and a small balcony with a two seater outdoor table. The living area and main bedroom is included with ceiling fans. With one queen bed in the master room and two sets of single bunk beds in the second bedroom. Linen provided for the number of people included in the booking. Villa includes: electric blanket on main bed, microwave, stove, oven, fridge, electric frypan, kettle, toaster, crockery, cutlery, pots and pans, split system heating and air con, digital flat screen television with DVD player, small flat screen television in master room, ensuite, hair dryer, iron and iron board. This brand new premium family villa is one of the most modern luxurious villas on the property. It offers a large balcony with six seater outdoor table, six seater indoor dining table, living area, main and second bedroom included with ceiling fans, two bar stools, an oversized two person bean bag and two seater couches in the living area. With one queen bed in the master room, two separate single beds in the second room and two sets of single bunk beds in the third bedroom. Linen provided for the number of people included in the booking. Villa includes: electric blanket on main separate single beds (not bunks), microwave, stove, oven, fridge, nespresso coffee pod machine, sandwich press, slow cooker, rice cooker, kettle, toaster, crockery, cutlery, pots and pans, split system heating and air conditioning, digital flat screen television with DVD player, small flat screen television in Master room, Ipod/Ipad docking station, ensuite, hair dryer, iron and iron board. This brand new premium family villa is one of the most modern and luxurious villas on the property. It offers a balcony with six seater outdoor table,seater indoor dining table, living area and main bedroom included with ceiling fans, two bar stools, an oversized two person bean bag and two seater couches in the living area. With one queen bed in the master room and two sets of single bunk beds in the second bedroom. Linen provided for the number of people included in the booking. Villa includes: electric blanket on main bed, microwave, stove, oven, fridge, nespresso coffee pod machine, sandwich press, slow cooker, rice cooker, kettle, toaster, crockery, cutlery, pots and pans, split system heating and air conditioning, digital flat screen television with DVD player, small flat screen television in Master room, Ipod/Ipad docking station, ensuite, hair dryer, iron and iron board. This brand new premium villa is one of the most modern and luxurious villas on the property. It offers a balcony with six seater outdoor table, six seater indoor dining table, living area and main bedroom included with ceiling fans, two bar stools, an oversized two person bean bag and a two seater couch in the living area. Villa includes: electric blanket on main bed, microwave, stove, oven, fridge, nespresso coffee pod machine, sandwich press, slow cooker, rice cooker, kettle, toaster, crockery, cutlery, pots and pans, split system heating and air con, digital flat screen television with DVD player, small flat screen television a in Master room, Ipod/Ipad docking station, ensuite, hair dryer, iron and iron board. The deluxe family villas would be our most affordable family friendly cabin on the property. Offering a spacious living area with vaulted ceilings, two seater couches and a nice large balcony for the family to sit. The living area and main bedroom is also included with ceiling fans. Villa includes: electric Blanket on main bed, microwave, stove, oven, fridge, electric fry-pan, kettle, toaster, crockery, cutlery, pots and pans, split system heating and air con, digital flat screen television with DVD player, small flat screen television in master room, ensuite, hair dryer, iron, iron board. The two bedroom villas are a great cabin for couples sharing offering two large main beds. The villa offers a small lounge area with vaulted ceilings and a two seater sofa. There is no balcony in this cabin. The living area and main bedroom is included with ceiling fans. 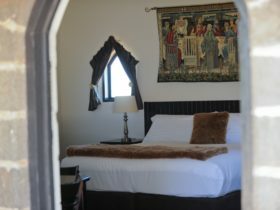 With one queen bed in the master room and one double bed with a single bunk bed above the double in the second bedroom. Linen provided for the number of people included in the booking. Villa includes: electric blanket on large beds, microwave, stove , fridge, electric frypan, kettle, toaster, crockery, cutlery, pots and pans, split system heating and air con, digital flat screen telebision with DVD player, small flat screen television in master room, ensuite, hair dryer, iron and iron Board. Starting prices are based on up to two people sharing.